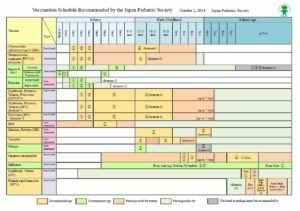 Please refer to Japan Pediatric Society, to obtain up-to date information. Recommended vaccinations start at 2 months of age. Individual planning is important. Ask your pediatrician or public health nurse to help you. 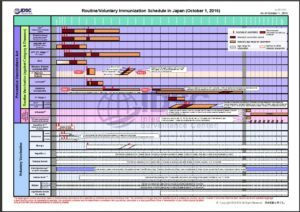 If you plan to leave Japan in the near future, tell your doctor or nurse. or risk of side effects. Please keep using the same product. If you change the brand of vaccine, vaccination may not result in effective immunity. However completion of the series of shots should be the priority. *As for the intervals between two different vaccines, please refer to the following.